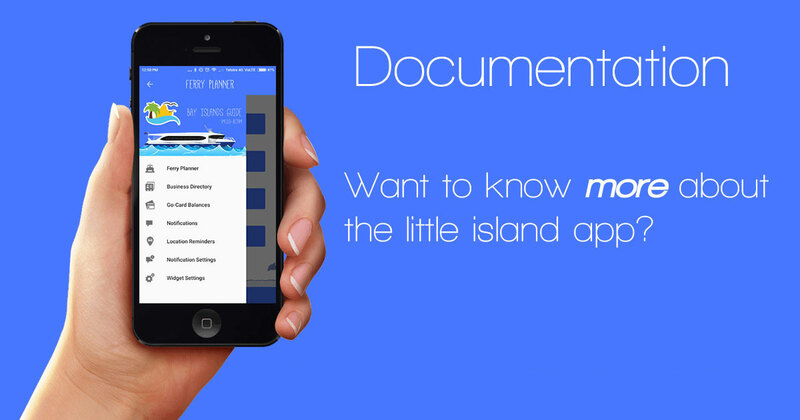 This is the documentation and frequently asked questions for Bay Islands Guide. Why does BIG ask for access to my contacts? This is due to how the permissions system works on Android devices. We are requesting access to identify if this device has previously used earlier versions of Bay Islands Guide. For this, we need an identifying piece of information, such as your email address. Rest assured that we will never sell your email address to anybody, and will never send you unsolicited email. In the future, we will need this to be able to unlock premium features for paid users. Why does BIG ask for access my location? Simply put, this is for things like the emergency notification system and location reminders. In the case of notifications, we use your location to target a notification to certain relevant devices. For example, if there is an emergency on Macleay Island, we can notify all Macleay Island residents, without worrying people on other islands. In the case of the Location Reminders, we use the location to be able to remind you where you last parked your car. Why is Bay Islands Guide now free? What's the catch? There's no catch. There's no ads. Its completely FREE. We wanted to help the community even more. This meant making the app free, and removing the price barrier. Although we never felt that Bay Islands Guide was expensive (some people even praised how cheap it was) we hope that more people will install and use it now that it's free. Another benefit of more users, is that our notification system (for emergencies and such) will be more effective. Really, its all about making island life easier. What does the "Ferry Planner" do? As the name suggests, the Ferry Planner helps you plan what ferry you're going to catch. Simply enter in the information required, such as your location, destination, and the date and time you wish to travel, and press "Find a ferry". Bay Islands Guide will then check our servers, and return the ferry that best matches your query. Are the ferry times accurate? How often is the timetable updated? To ensure you always get the right information, we use the same timetable data as TransLink. If there are any changes, or special ferries, we'll know about it straight away. Can I be reminded before my ferry is due to depart? Of course. Simply search for the time and date you wish to travel. Once you can see the result, press on the "Set a reminder" button. We will then automatically give you reminders 20 minutes before the ferry is due to depart, and also 10 minutes before. What kinds of businesses are in the business directory? Our business directory is made for the local businesses of the Southern Moreton Bay Islands. The businesses have either been added by the business owners themselves, or by Bay Islands Info staff. Can I add my own local business, and if so, how? Anyone can add a business to the business directory, and its easy too! Just head over to Bay Islands Info and click on the big "Add a business" button and follow the prompts. There are several paid packages, as well as a free package. Once you've filled in your information, it will be checked by our staff, then made live on Bay Islands Info website, Facebook, Twitter, and of course, Bay Islands Guide app. Can I contact the business from within your app? If the business owner has supplied a contact phone number or address for their business, they will be displayed in the app. You can simply touch on the phone number to call them, or use the included map to get turn-by-turn directions on how to get to their premises. If you want to share the business details with someone else, simply touch on the share button and select your preferred method to share. I want to monitor the balance of my Go-Card. How can I do it? The first thing you need to do, is register your Go-Card with TransLink, and create a password. To do this, you can either call TransLink, or visit the Go-Card website and create an account. Once you've done that, open Bay Islands Guide and choose "Go-Card Balances" from the side menu. Then, press the + button and fill in your Go-Card details. You can select the type of Go-Card you have as well. This is for display purposes only, and does not affect anything. You can also name your card, which will make it easier if you want to monitor several card balances. How many Go-Card balances can I monitor? Is there a limit? To be honest, we've only ever tested up to 5 cards at once, although there is technically no limit. Dont forget to name each card and select a card type (Adult, Child, Concession, Senior) to make it easier to tell which card is which. I dont feel very comfortable putting my password into the app. Is it secure? While your Go-Card number and password travel through our servers, we do not monitor or store your Go-Card number, password, or balance at all. All balance checking is done by TransLink, via our servers. This was necessary to make a reliable experience for you. All data transmitted from Bay Islands Guide to our servers is encryped using industry standard encryption (SSLv3/TLS). The "Notifications" section of Bay Islands Guide is where notifications are stored, so you can keep them, delete them etc. When you recieve a notification, it may be stored in here. Touching on the notification will launch the web page that was linked in the notification. How can I delete a notification if I'm not interested in it, or after I've read it? To delete a notification, simply swipe it to the left, and confirm you want to delete it. This can't be undone, so be sure you want to delete a notification. I'm getting a lot of notifications that I'm not really interested in. What can I do about it? We made our notification system as flexible as possible. All notifications are divided up into 'categories' of interest. You can 'subscribe' or 'unsubscribe' to a category at any time. While unsubscribed from a category, you wont recieve any notifications of that type. Check out the 'Notification Settings' section for more information. What is a location reminder, and why would I use it? Simply put, it allows you to remember your current location. This is especially useful when you park your car on the mainland. Open Bay Islands Guide, add a location reminder, and voila! You now have the location of your car saved, for when you next come back to the mainland. No more looking endlessly for your car. It's not only limited to cars, either. You can use the location reminder to store any type of location. We've included 'Car', 'Hotel' and 'Other by default. But what if my husbane/wife/friend parked my car last time? How can I find it? Easy. Just ask them to share the location reminder with you. If you have Bay Islands Guide installed on your phone, it will automatically add to your own locations reminders. If you dont have Bay Islands Guide (shame on you) you will still be shown a map of where your car is located. How good is that? What is this part of the app all about? We built a flexible notification system, allowing you to choose what type of notifications you recieve. Each notification is split into one (or more) categories, as seen in the 'Notification Settings' section of Bay Islands Guide. I'm really not interested in some of these notifications I've been getting. Can I turn them off? Of course you can. This is where our flexible notification system really shines. Instead of allowing/denying all notifications, you can hand pick what types of notifications you are interested in. If you arent interested in (for example) 'Real Estate Notifications' all you have to do is uncheck that category. That's it. You will immediately stop getting real estate related notifications. We've turned on all the categories by default, but promise not to bombard you with hundreds of notifications. I've turned off all the notification categories, but I still get the occasional notification. What's up with that? Besides all of the categories, there is a main notification type that you can't unsubscribe from. This notification type is for edge cases where the flexible system may not be working, or when we need to get a message to all of our users. If you recieve more than one of these a month, please, let us know.